WTI crude oil prices settled back down below $100 per barrel this week, but according to Money Morning's Global Energy Strategist Dr. Kent Moors, oil prices may not stay that low for very long. 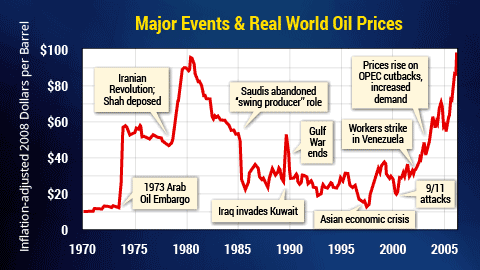 This chart shows exactly how prices have surged following major geopolitical events from the past four decades. However, unlike the previous conflicts of the last 40 years, the current situation in Iraq has the potential to push prices to unprecedented levels. While Iraq has been the center of political and military strife for decades, this situation is very different from any conflict that has come before. The current situation in Iraq is a religious war, between the Sunni militants and Shiite Muslims. It's a humanitarian crisis that spans political, religious, and territorial borders. The situation escalated in June when Sunni militants from the Islamic State of Iraq and Syria (ISIS) began attacking cities in the northern part of the country, in an attempt to overthrow the Sunni-controlled government. By overthrowing the government, ISIS plans to create an Islamic state that spans from northern Iraq into northern Syria. That would effectively splinter the area into numerous new countries, many of which would be controlled by radicals. In the month of June, militants overtook much of northern Iraq including the country's second largest city, Mosul, the city of Fallujah, and one of the country's largest oil-producing provinces, Kirkuk. The fighting also bled across the Syrian border. The fighting has left the country on the verge of disintegration, as Sunnis, Shiites, and Kurds in the northern region wrestle for control. By the beginning of July, more than 500,000 civilians in these regions had been forced to flee their homes. The insurgency has affected major oil fields and refineries in Northern Iraq, where much of the country's proven oil reserves are located.